Shaft - Stiff flex CFS steel shafts, for golfers with faster swing speeds. Condition - Good, PING's Anser Forged irons offer a mix of forgiveness and playability with a great forged iron softer metal feel. These irons have been kept in a good condition. There is very light pittting to some of the heads. Shaft - Regular flex CFS steel shafts, for golfers with average swing speeds. Condition - Good, PING's Anser Forged irons offer a mix of forgiveness and playability with a great forged iron softer metal feel. These irons have been kept in good condition. There are usage / stone marks to the soles, usage marks to the Pitching Wedge and 9-iron faces and some wear to the 7-iron badge. The Anser Forged Irons are forged from 8620 Stainless Steel with a tungsten sole weight. Anser Forged irons provide both forgiveness and playability. The Anser Forged irons have stabilizing bars that position the centre of gravity low in the longer irons for high ball speed and high launch angles whilst the shorter irons have more vertical stabilizing bars that make the shorter irons deliver a more penetrating ball flight. The Anser Forged irons provide clean lines, a soft feel and are finished with a satin-chrome plating. The Anser Forged irons are available from 3-iron to Pitching Wedge As standard the Anser irons have two shaft options; the TFC800i lightweight graphite shaft for high launch and the steel Rifle Project X Rifle shaft the offers a penetrating trajectory and firmer feel. 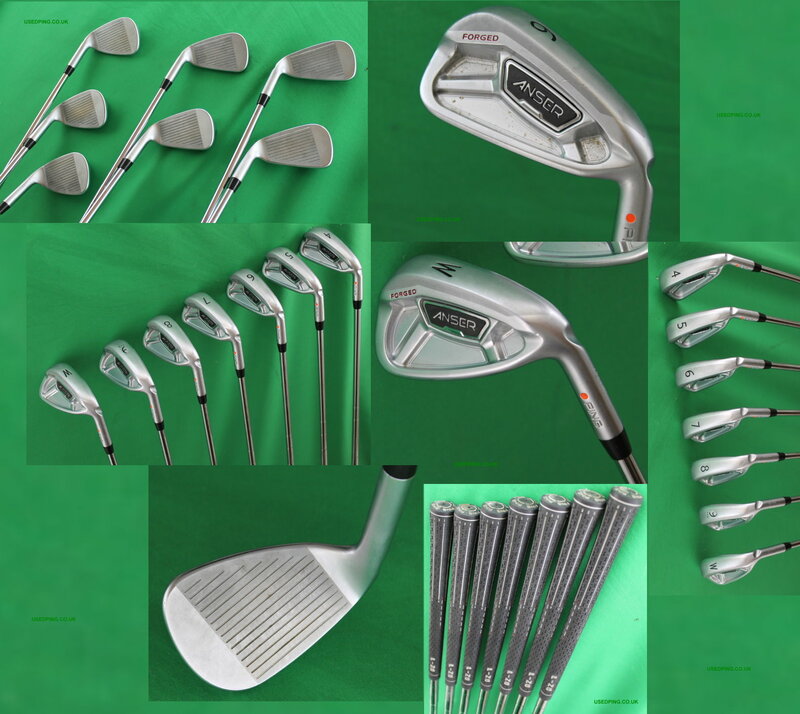 Pre 2012 Anser iron sets came with the TFC169i graphite shafts rather than the TFC800i and have a silver badge rather than the black badge provided after the 2012 update. 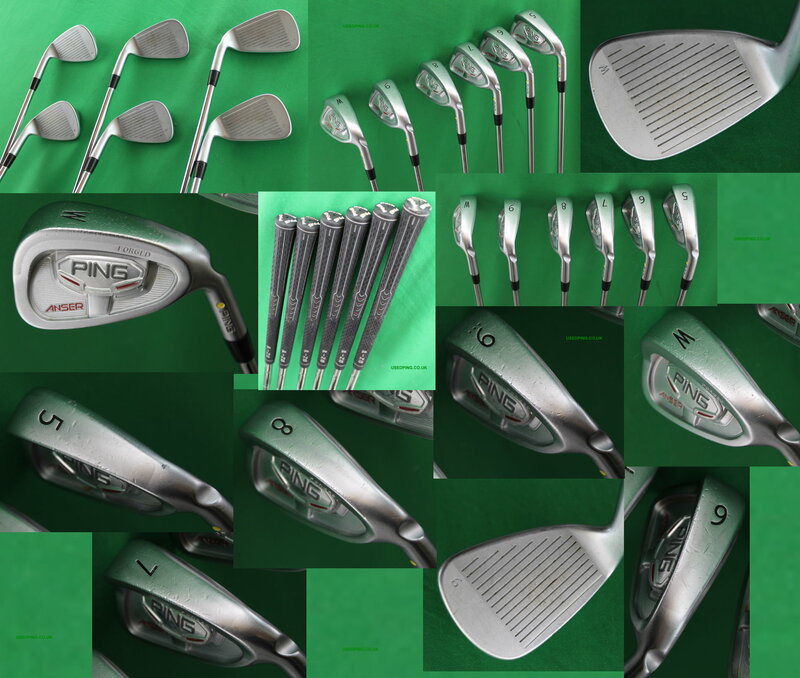 "Just taken delivery of my Ping's and just wanted to say many thanks for the great service you've provided me with from start to finish." J.Rowland, Manchester. "I wanted to take the opportunity to thank you for such a fantastic service! Everything stated i.e. fast, honest, reliable service is 100% accurate. I couldn't be any more satisfied, in fact, I am delighted with the whole end to end service. Customer Service is something I am very familiar with as I am a Area Service Delivery Manager for BT and your service is outstanding. Please feel free to use my feedback as one is for sure, you get 5 Stars from me. I will certainly be passing your good name around my golfing friends. Once again, thanks for a super service!” – D. Renshaw, Sheffield. "I have been very pleased and impressed with all aspects when dealing with your company. From the purchase to the re-sale transactions and including the quality of the product. I've enjoyed (nearly) two years of use from the clubs I bought and being able to re-sell these clubs back to yourselves in a professional way is a real bonus. If I was looking again for a set of used Pings I would have no hesitation in doing (or recommending) business with your company again. Thank you for making the whole experience (Purchase thru re-sale) as simple as possible" -John B., Leicestershire.